Prime Minister and acting President Hwang Kyo-ahn on Friday said that he was not considering an extension of the ongoing special investigation, in an apparent move to distance himself from calls for President Park Geun-hye’s ouster. He also argued that the Constitutional Court should be left to make its own judgment on the president’s impeachment, and expressed concerns on the anti-Park public sentiment. “The independent counsel still has some 20 days more to go, and now is not the right time to consider its extension,” Hwang said at the parliamentary interpellation session on non-economic sectors. As acting president, Hwang currently holds the authority to decide whether or not to give the special prosecutors an extra month to look into the corruption allegations against President Park and her associates. The prime minister, deemed a potential presidential candidate for the conservative camp, has so far remained passive on taking action against the scandal-ridden president. “It is not I who turned down the investigators’ raid (last week),” Hwang said. The acting president also expressed disapproval of the political pressure calling for Park’s impeachment. “The impeachment trial is entirely up to the Constitutional Court, so it is inappropriate to try to sway its judgment or to prejudge the final result,” Hwang said. Hwang did not comment on his widely anticipated bid in the upcoming presidential race, which will take place earlier than usual if the court confirms the incumbent president’s impeachment. “I am doing my very best to perform my current role, which I take very seriously, and have no thoughts (of abandoning the post mid-term to run in the presidential race),” he said. A survey by Gallup Korea showed Friday that in the second week of February, Hwang was ranked third among potential presidential runners, with 11 percent in approval rating, up 2 percent from the previous week. He is also currently the only conservative figure with a two-digit approval rating. “There will come a time when I may speak of such things,” the prime minister had said several times, neither recognizing nor denying the escalating rumors on his presidential bid. 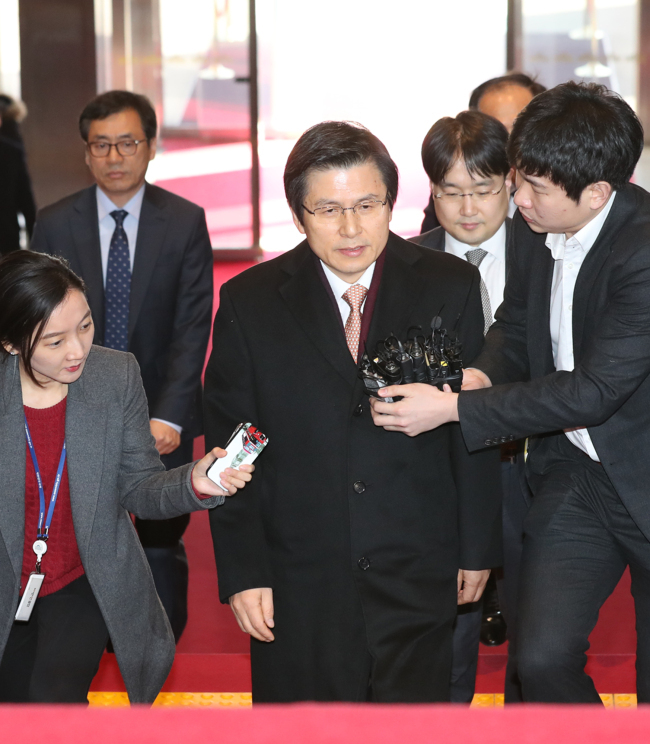 His vague stance, which was taken as a tacit acknowledgment, has triggered backlashes from the opposition circles, which considered Hwang as the president’s right-hand man. “Hwang doesn’t stand much chance (in the presidential election),” said Kim Chong-in, former interim chief of the main opposition Democratic Party of Korea, in a radio interview with CBS. Rep. Park Jie-won, chairman of the runner-up opposition People’s Party, accused Hwang of neglecting state affairs and pretending to be the state chief. “I hope that he will at least give a straight answer on his presidential bid, which is the subject of curiosity for everybody,” said floor leader Rep. Joo Seung-yong. Rep. Chung Byoung-gug, chief of the Bareun Party, pointed out that as presidential substitute, Hwang should not quit his current role and turn his eyes to the presidency. But the ruling conservative Saenuri Party, which has recently decided to changing its name to Liberty Korea Party, stood by the prime minister. “The interpellation should focus on key state affairs and policies, instead of finding faults (with Hwang),” said floor leader Rep. Chung Woo-taik.